Megalosaurus (meaning "Great Lizard", from Greek μέγας, megas, meaning 'big', 'tall' or 'great' and σαῦρος, sauros, meaning 'lizard') is an extinct genus of large meat-eating theropod dinosaurs of the Middle Jurassic period (Bathonian stage, 166 million years ago) of Southern England. Although fossils from other areas have been assigned to the genus, the only certain remains of Megalosaurus come from Oxfordshire and date to the late Middle Jurassic. The earliest possible fossils of the genus came from the Taynton Limestone Formation. One of these was the lower part of a femur, discovered in the 17th century. It was originally described by Robert Plot as a thighbone of a Roman war elephant, and then as a biblical giant. The first scientific name given for it, in the 18th century, was Scrotum humanum, created by Richard Brookes as a caption; however, this is not considered valid today. Megalosaurus was, in 1824, the first genus of non-avian dinosaur to be validly named. The type species is Megalosaurus bucklandii, named in 1827. In 1842, Megalosaurus was one of three genera on which Richard Owen based his Dinosauria. On Owen's directions a model was made as one of the Crystal Palace Dinosaurs, which greatly increased the public interest for prehistoric reptiles. Subsequently, over fifty other species would be classified under the genus, originally because dinosaurs were not well known, but even during the 20th century after many dinosaurs had been discovered. Today it is understood these additional species were not directly related to M. bucklandii, which is the only true Megalosaurus species. Because a complete skeleton of it has never been found, much is still unclear about its build. The first naturalists who investigated Megalosaurus mistook it for a gigantic lizard of twenty metres length. In 1842, Owen concluded that it was no longer than nine metres, standing on upright legs. He still thought it was a quadruped, though. Modern scientists, by comparing Megalosaurus with its direct relatives in the Megalosauridae, were able to obtain a more accurate picture. Megalosaurus was about six metres long, weighing about seven hundred kilogrammes. It was bipedal, walking on stout hindlimbs, its horizontal torso balanced by a horizontal tail. Its forelimbs were short, though very robust. Megalosaurus had a rather large head, equipped with long curved teeth. It was generally a robust and heavily muscled animal. Megalosaurus may have been the first dinosaur, apart from modern birds, to be described in the scientific literature. Part of a bone was recovered from the Taynton Limestone Formation of Stonesfield limestone quarry, Oxfordshire in 1676. Sir Thomas Pennyson gave the fragment to Robert Plot, Professor of Chemistry at the University of Oxford and first curator of the Ashmolean Museum, who published a description and illustration in his Natural History of Oxfordshire in 1676. It was the first illustration of a dinosaur bone published. Plot correctly identified the bone as the lower extremity of the thighbone or femur of a large animal and he recognized that it was too large to belong to any species known to be living in England. He therefore at first concluded it to be the thighbone of a Roman war elephant and later that of a giant human, such as those mentioned in the Bible. The bone has since been lost, but the illustration is detailed enough that some have since identified it as that of Megalosaurus. It has also been argued that this possible Megalosaurus bone was given the very first species name ever applied to an extinct dinosaur. Plot's engraving of the Cornwell bone was again used in a book by Richard Brookes in 1763. Brookes, in a caption, called it "Scrotum Humanum," apparently comparing its appearance to a pair of "human testicles". In 1970, paleontologist Lambert Beverly Halstead pointed out that the similarity of Scrotum humanum to a modern species name, a so-called Linnaean "binomen" that has two parts, was not a coincidence. Linnaeus, the founder of modern taxonomy, had in the eighteenth century not merely devised a system for naming living creatures, but also for classifying geological objects. The book by Brookes was all about applying this latter system to curious stones found in England. According to Halstead, Brookes thus had deliberately used binomial nomenclature, and had in fact indicated the possible type specimen of a new biological genus. According to the rules of the International Code of Zoological Nomenclature (ICZN), the name Scrotum humanum in principle had priority over Megalosaurus because it was published first. That Brookes understood that the stone did not actually represent a pair of petrified testicles was irrelevant. Merely the fact that the name had not been used in subsequent literature meant that it could be removed from competition for priority, because the ICZN states that if a name has never been considered valid after 1899, it can be made a nomen oblitum, an invalid "forgotten name". In 1993, after the death of Halstead, his friend William A.S. Sarjeant submitted a petition to the International Commission on Zoological Nomenclature to formally suppress the name Scrotum in favour of Megalosaurus. He wrote that the supposed junior synonym Megalosaurus bucklandii should be made a conserved name to ensure its priority. However, the Executive Secretary of the ICZN at the time, Philip K. Tubbs, did not consider the petition to be admissible, concluding that the term "Scrotum humanum", published merely as a label for an illustration, did not constitute the valid creation of a new name, and stated that there was no evidence it was ever intended as such. Furthermore, the partial femur was too incomplete to definitely be referred to Megalosaurus and not a different, contemporary theropod. Lithography from William Buckland's "Notice on the Megalosaurus or great Fossil Lizard of Stonesfield", 1824. Caption reads "anterior extremity of the right lower jaw of the Megalosaurus from Stonesfield near Oxford". During the last part of the eighteenth century, the number of fossils in British collections quickly increased. According to an hypothesis published by science historian Robert William Theodor Gunther in 1925, among them was a partial lower jaw of Megalosaurus, acquired in October 1797 by Christopher Pegge for 10s.6d. and added to the collection of the Anatomy School of Christ Church college. In the early nineteenth century, more discoveries were made. In 1815, John Kidd reported the find of bones of giant tetrapods, again at the Stonesfield quarry. The layers there are currently considered part of the Taynton Limestone Formation, dating to the mid-Bathonian stage of the Jurassic Period. The bones were apparently acquired by William Buckland, Professor of Geology at the University of Oxford and dean of Christ Church. 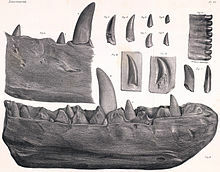 Buckland also studied a lower jaw, according to Gunther the one bought by Pegge. Buckland did not know to what animal the bones belonged but, in 1818, after the Napoleonic Wars, the French comparative anatomist Georges Cuvier visited Buckland in Oxford and realised that they were those of a giant lizard-like creature. Buckland further studied the remains with his friend William Conybeare who in 1821 referred to them as the "Huge Lizard". In 1822 Buckland and Conybeare, in a joint article to be included in Cuvier's Ossemens, intended to provide scientific names for both gigantic lizard-like creatures known at the time: the remains found near Maastricht would be named Mosasaurus – then seen as a land-dwelling animal – while for the British lizard Conybeare had devised the name Megalosaurus, from the Greek μέγας, megas, "large". That year a publication failed to occur, but the physician James Parkinson already in 1822 announced the name Megalosaurus, illustrating one of the teeth and revealing the creature was forty feet long and eight feet high. It is generally considered the name in 1822 was still a nomen nudum ("naked name"). Buckland, urged on by an impatient Cuvier, continued to work on the subject during 1823, letting his later wife Mary Morland provide drawings of the bones, that were to be the basis of illustrating lithographies. Finally, on 20 February 1824, during the same meeting of the Geological Society of London in which Conybeare described a very complete specimen of Plesiosaurus, Buckland formally announced Megalosaurus. The descriptions of the bones in the Transactions of the Geological Society, in 1824, constitute a valid publication of the name. Megalosaurus was the first non-avian dinosaur genus named; the first of which the remains had with certainty been scientifically described was Streptospondylus, in 1808 by Cuvier. By 1824, the material available to Buckland consisted of specimen OUM J13505, a piece of a right lower jaw with a single erupted tooth; OUM J13577, a posterior dorsal vertebra; OUM J13579, an anterior caudal vertebra; OUM J13576, a sacrum of five sacral vertebrae; OUM J13585, a cervical rib; OUM J13580, a rib; OUM J29881, an ilium of the pelvis, OUM J13563, a piece of the pubic bone; OUM J13565, a part of the ischium; OUM J13561, a thighbone and OUM J13572, the lower part of a second metatarsal. As he himself was aware, these did not all belong to the same individual; only the sacrum was articulated. Because they represented several individuals, the described fossils formed a syntype series. By modern standards, from these a single specimen has to be selected to serve as the type specimen on which the name is based. In 1990, Ralph Molnar chose the famous dentary (front part of the lower jaw), OUM J13505, as such a lectotype. Because he was unaccustomed to the deep dinosaurian pelvis, much taller than with typical reptiles, Buckland misidentified several bones, interpreting the pubic bone as a fibula and mistaking the ischium for a clavicle. Buckland identified the organism as being a giant animal belonging to the Sauria – the Lizards, at the time seen as including the crocodiles – and he placed it in the new genus Megalosaurus, repeating an estimate by Cuvier that the largest pieces he described, indicated an animal twelve metres long in life. Buckland had not provided a specific name, as was not uncommon in the early nineteenth century, when the genus was still seen as the more essential concept. In 1826, Ferdinand von Ritgen gave this dinosaur a complete binomial, Megalosaurus conybeari, which however was not much used by later authors and is now considered a nomen oblitum. A year later, in 1827, Gideon Mantell included Megalosaurus in his geological survey of southeastern England, and assigned the species its current valid binomial name, Megalosaurus bucklandii. Until recently, the form Megalosaurus bucklandi was often used, a variant first published in 1832 by Christian Erich Hermann von Meyer – and sometimes erroneously ascribed to von Ritgen – but the more original M. bucklandii has priority. The first reconstruction was given by Buckland himself. He considered Megalosaurus to be a quadruped. He thought it was an "amphibian", i.e. an animal capable of both swimming in the sea and walking on land. Generally, in his mind Megalosaurus resembled a gigantic lizard, but Buckland already understood from the form of the thighbone head that the legs were not so much sprawling as held rather upright. In the original description of 1824, Buckland repeated Cuvier's size estimate that Megalosaurus would have been forty feet long with the weight of a seven foot tall elephant. However, this had been based on the remains present at Oxford. Buckland had also been hurried into naming his new reptile by a visit he had made to the fossil collection of Mantell, who during the lecture announced to have acquired a fossil thighbone of enormous magnitude, twice as long as that just described. Today, this is known to have belonged to Iguanodon, or at least some iguanodontid, but at the time both men assumed this bone belonged to Megalosaurus also. Even taking into account the effects of allometry, heavier animals having relatively stouter bones, Buckland was forced in the printed version of his lecture to estimate the maximum length of Megalosaurus at sixty to seventy feet. The existence of Megalosaurus posed some problems for Christian orthodoxy, which typically held that suffering and death had only come into the world through Original Sin, which seemed irreconcilable with the presence of a gigantic devouring reptile during a pre-Adamitic phase of history. Buckland rejected the usual solution, that such carnivores would originally have been peaceful vegetarians, as infantile and claimed in one of the Bridgewater Treatises that Megalosaurus had played a beneficial rôle in creation by ending the lives of old and ill animals, "to diminish the aggregate amount of animal suffering". Around 1840, it became fashionable in England to espouse the concept of the transmutation of species as part of a general progressive development through time, as expressed in the work of Robert Chambers. In reaction, on 2 August 1841 Richard Owen during a lecture to the British Association for the Advancement of Science claimed that certain prehistoric reptilian groups had already attained the organisational level of present mammals, implying there had been no progress. Owen presented three examples of such higher level reptiles: Iguanodon, Hylaeosaurus and Megalosaurus. For these, the "lizard model" was entirely abandoned: they would have had an upright stance and a high metabolism. This also meant that earlier size estimates had been exaggerated. By simply adding the known length of the vertebrae, instead of extrapolating from a lizard, Owen arrived at a total body length for Megalosaurus of thirty feet. In the printed version of the lecture published in 1842, Owen united the three reptiles into a separate group: the Dinosauria. Megalosaurus was thus one of the three original dinosaurs. In 1852, Benjamin Waterhouse Hawkins was commissioned to build a life-sized concrete model of Megalosaurus for the exhibition of prehistoric animals at the Crystal Palace Park in Sydenham, where it remains to this day. Hawkins worked under the direction of Owen and the statue reflected Owen's ideas that Megalosaurus would have been a mammal-like quadruped. The sculpture in Crystal Palace Park shows a conspicuous hump on the shoulders and it has been suggested this was inspired by a set of high vertebral spines acquired by Owen in the early 1850s. Today, they are seen as a separate genus Becklespinax, but Owen referred them to Megalosaurus. The models at the exhibition created a general public awareness for the first time, at least in England, that ancient reptiles had existed. The presumption that carnivorous dinosaurs, like Megalosaurus, were quadrupeds was first challenged by the find of Compsognathus in 1859. That, however, was a very small animal, the significance of which for gigantic forms could be denied. In 1870, near Oxford, the type specimen of Eustreptospondylus was discovered - the first reasonably intact skeleton of a large theropod. It was clearly bipedal. Shortly afterwards, John Phillips created the first public display of a theropod skeleton in Oxford, arranging the known Megalosaurus bones, held by recesses in cardboard sheets, in a more or less natural position. During the 1870s, North American discoveries of large theropods, like Allosaurus, confirmed that they were bipedal. The Oxford University Museum of Natural History display contains most of the specimens from the original description by Buckland. The quarries at Stonesfield, which were worked until 1911, continued to produce Megalosaurus bucklandii fossils, mostly single bones from the pelvis and hindlimbs. Vertebrae and skull bones are rare. In 2010, Roger Benson counted a total of 103 specimens from the Stonesfield Slate, from a minimum of seven individuals. It has been contentious whether this material represents just a single taxon. In 2004, Julia Day and Paul Barrett claimed that there were two morphotypes present, based on small differences in the thighbones. In 2008 Benson favoured this idea, but in 2010 concluded the differences were illusory. A maxilla fragment, specimen OUM J13506, was, in 1869 assigned, by Thomas Huxley, to M. bucklandii. In 1992 Robert Thomas Bakker claimed it represented a member of the Sinraptoridae; in 2007, Darren Naish thought it was a separate species belonging to the Abelisauroidea. In 2010, Benson pointed out that the fragment was basically indistinguishable from other known M. bucklandii maxillae, to which it had in fact not been compared by the other authors. Apart from the finds in the Taynton Limestone Formation, in 1939 Sidney Hugh Reynolds referred remains to Megalosaurus that had been found in the older Chipping Norton Limestone Formation dating from the early Bathonian, about thirty single teeth and bones. Though the age disparity makes it problematic to assume an identity with Megalosaurus bucklandii, in 2009 Benson could not establish any relevant anatomical differences with M. bucklandii among the remains found at one site, the New Park Quarry, and therefore affirmed the reference to that species. However, in another site, the Oakham Quarry, the material contained one bone, an ilium, that was clearly dissimilar. Sometimes trace fossils have been referred to Megalosaurus or to the ichnogenus Megalosauripus. In 1997, a famous group of fossilised footprints (ichnites) was found in a limestone quarry at Ardley, twenty kilometres northeast of Oxford. They were thought to have been made by Megalosaurus and possibly also some left by Cetiosaurus. There are replicas of some of these footprints, set across the lawn of the Oxford University Museum of Natural History. One track was of a theropod accelerating from walking to running. According to Benson, such referrals are unprovable, as the tracks show no traits unique to Megalosaurus. Certainly they should be limited to finds that are of the same age as Megalosaurus bucklandii. Finds from sites outside England, especially in France, have in the nineteenth and twentieth century been referred to M. bucklandii. In 2010 Benson considered these as either clearly different or too fragmentary to establish an identity. Since the first finds, many other Megalosaurus bones have been recovered; however, no complete skeleton has yet been found. Therefore, the details of its physical appearance cannot be certain. However, a full osteology of all known material was published in 2010 by Benson. Traditionally, most texts, following Owen's estimate of 1841, give a body length of thirty feet or nine metres for Megalosaurus. The lack of an articulated dorsal vertebral series makes it difficult to determine an exact size. David Bruce Norman in 1984 thought Megalosaurus was seven to eight metres long. Gregory S. Paul in 1988 estimated the weight tentatively at 1.1 tonnes, given a thighbone seventy-six centimetres long. The trend in the early twenty-first century to limit the material to the lectotype inspired even lower estimates, disregarding outliers of uncertain identity. Paul in 2010 stated Megalosaurus was six metres long and seven hundred kilogrammes heavy. However, the same year Benson claimed that Megalosaurus, though medium-sized, was still among the largest of Middle Jurassic theropods. Specimen BMNH 31806, a thighbone 803 millimetres long, would indicate a body weight of 943 kilogrammes, using the extrapolation method of J.F. Anderson — which method, optimised for mammals, tends to underestimate theropod masses by at least a third. Furthermore, thighbone specimen OUM J13561 has a length of about eighty-six centimetres. In general, Megalosaurus had the typical build of a large theropod. It was bipedal, the horizontal torso being balanced by a long horizontal tail. The hindlimbs were long and strong with three forward-facing weight-bearing toes, the forelimbs relatively short but exceptionally robust and probably carrying three digits. Being a carnivore, its large elongated head bore long dagger-like teeth to slice the flesh of its prey. The skeleton of Megalosaurus is highly ossified, indicating a robust and muscular animal, though the lower leg was not as heavily built as that of Torvosaurus, a close relative. 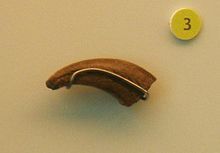 Referred tooth of M. bucklandii. The skull of Megalosaurus is poorly known. The discovered skull elements are generally rather large in relation to the rest of the material. This can either be coincidental or indicate that Megalosaurus had an uncommonly large head. The praemaxilla is not known, making it impossible to determine whether the snout profile was curved or rectangular. A rather stubby snout is suggested by the fact that the front branch of the maxilla was short. In the depression around the antorbital fenestra to the front, a smaller non-piercing hollowing can be seen that is probably homologous to the fenestra maxillaris. The maxilla bears thirteen teeth. The teeth are relatively large, with a crown length up to seven centimetres. The teeth are supported from behind by tall, triangular, unfused interdental plates. The cutting edges bear eighteen to twenty denticula per centimetre. The tooth formula is probably 4, 13–14/13–14. The jugal bone is pneumatised, pierced by a large foramen from the direction of the antorbital fenestra. It was probably hollowed out by an outgrowth of an air sac in the nasal bone. Such a level of pneumatisation of the jugal is not known from other megalosaurids and might represent a separate autapomorphy. The lower jaw is rather robust. It is also straight in top view, without much expansion at the jaw tip, suggesting the lower jaws as a pair, the mandibula, were narrow. Several traits in 2008 identified as autapomorphies, later transpired to have been the result of damage. However, a unique combination of traits is present in the wide longitudinal groove on the outer side (shared with Torvosaurus), the small third dentary tooth and a vascular channel, below the row of interdental plates, that only is closed from the fifth tooth position onwards. The number of dentary teeth was probably thirteen or fourteen, though the preserved damaged specimens show at most eleven tooth sockets. The interdental plates have smooth inner sides, whereas those of the maxilla are vertically grooved; the same combination is shown by Piatnitzkysaurus. The surangular has no bony shelf, or even ridge, on its outer side. There is laterally an oval opening present in front of the jaw joint, a foramen surangulare posterior, but a second foramen surangulare anterior to the front of it is lacking. Although the exact numbers are unknown, the vertebral column of Megalosaurus was probably divided into ten neck vertebrae, thirteen dorsal vertebrae, five sacral vertebrae and fifty to sixty tail vertebrae, as is common for basal Tetanurae. The Stonesfield Slate material contains no neck vertebrae; but a single broken anterior cervical vertebra is known from the New Park Quarry, specimen BMNH R9674. The breakage reveals large internal air chambers. The vertebra is also otherwise heavily pneumatised, with large pleurocoels, pneumatic excavations, on its sides. The rear facet of the centrum is strongly concave. The neck ribs are short. The front dorsal vertebrae are slightly opisthocoelous, with convex front centrum facets and concave rear centrum facets. They are also deeply keeled, with the ridge on the underside representing about 50% of the total centrum height. The front dorsals perhaps have a pleurocoel above the diapophysis, the lower rib joint process. The rear dorsal vertebrae, according to Benson, are not pneumatised. They are slightly amphicoelous, with hollow centrum facets. They have secondary joint processes, forming a hyposphene–hypantrum complex, the hyposphene having a triangular transverse cross-section. The height of the dorsal spines of the rear dorsals is unknown, but a high spine on a tail vertebra of the New Park Quarry material, specimen BMNH R9677, suggests the presence of a crest on the hip area. The spines of the five vertebrae of the sacrum form a supraneural plate, fused at the top. The undersides of the sacral vertebrae are rounded but the second sacral is keeled; normally it is the third or fourth sacral having a ridge. The sacral vertebrae seem not to be pneumatised but have excavations at their sides. The tail vertebrae are slightly amphicoelous, with hollow centrum facets on both the front and rear side. They have excavations at their sides and a longitudinal groove on the underside. The neural spines of the tail basis are transversely thin and tall, representing more than half of the total vertebral height. The shoulderblade or scapula is short and wide, its length about 6.8 times the minimum width; this is a rare and basal trait within Tetanurae. Its top curves slightly to the rear in side view. On the lower outer side of the blade a broad ridge is present, running from just below the shoulder joint to about midlength where it gradually merges with the blade surface. The middle front edge over about 30% of its length is thinned forming a slightly protruding crest. The scapula constitutes about half of the shoulder joint, which is oriented obliquely sideways and to below. The coracoid is in all known specimens fused with the scapula into a scapulocoracoid, lacking a visible suture. The coracoid as such is an oval bone plate, with its longest side attached to the scapula. It is pierced by a large oval foramen but the usual boss for the attachment of the upper arm muscles is lacking. The humerus is very robust with strongly expanded upper and lower ends. Humerus specimen OUMNH J.13575 has a length of 388 millimetres. Its shaft circumference equals about half of the total humerus length. The humerus head continues to the front and the rear into large bosses, together forming a massive bone plate. On the front outer side of the shaft a large triangular deltopectoral crest is present, the attachment for the Musculus pectoralis major and the Musculus deltoideus. It covers about the upper half of the shaft length, its apex positioned rather low. The ulna is extremely robust, for its absolute size more heavily built than with any other known member of the Tetanurae. The only known specimen, BMNH 36585, has a length of 232 millimetres and a minimal shaft circumference of 142 millimetres. The ulna is straight in front view and has a large olecranon, the attachment process for the Musculus triceps brachii. Radius, wrist and hand are unknown. 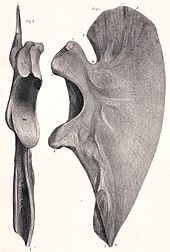 In the pelvis, the ilium is long and low, with a convex upper profile. Its front blade is triangular and rather short; at the front end there is a small drooping point, separated by a notch from the pubic peduncle. The rear blade is roughly rectangular. The outer side of the ilium is concave, serving as an attachment surface for the Musculus iliofemoralis, the main thigh muscle. Above the hip joint, on this surface a low vertical ridge is present with conspicuous vertical grooves. The bottom of the rear blade is excavated by a narrow but deep trough forming a bony shelf for the attachment of the Musculus caudofemoralis brevis. The outer side of the rear blade does not match the inner side, which thus can be seen as a separate "medial blade" that in side view is visible in two places: in the corner between outer side and the ischial peduncle and as a small surface behind the extreme rear tip of the outer side of the rear blade. The pubic bone is straight. The pubic bones of both pelvis halves are connected via narrow bony skirts that originated at a rather high position on the rear side and continued downwards to a point low on the front side of the shaft. The ischium is S-shaped in side view, showing at the transition point between the two curvatures a rough boss on the outer side. On the front edge of the ischial shaft an obturator process is present in the form of a low ridge, at its top separated from the shaft by a notch. To below, this ridge continues into an exceptionally thick bony skirt at the inner rear side of the shaft, covering over half of its length. Towards the end of the shaft, this skirt gradually merges with it. The shaft eventually ends in a sizeable "foot" with a convex lower profile. The thighbone is straight in front view. Seen from the same direction its head is perpendicular to the shaft, seen from above it is orientated 20° to the front. 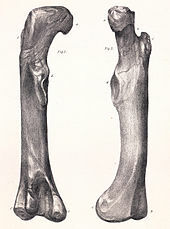 The greater trochanter is relatively wide and separated from the robust lesser trochanter in front of it, by a fissure. At the front base of the lesser trochanter a low accessory trochanter is present. At the lower end of the thighbone a distinct front, extensor, groove separates the condyles. At the upper inner side of this groove a rough area is present continuing inwards into a longitudinal ridge, a typical megalosauroid trait. The shinbone, or tibia, is relatively straight, slightly curving inwards. To below, its shaft progressively flattens from front to rear, resulting in a generally oval cross-section. For about an eighth of its length the front lower end of the shaft is covered by a vertical branch of the astragalus. Of the foot, only the second, third and fourth metatarsals are known, the bone elements that were connected to the three weight-bearing toes. They are straight and robust, showing ligament pits at their lower sides. The third metatarsal has no clear condyles at its lower end, resulting in a more flexible joint, allowing for a modicum of horizontal movement. The top inner side of the third metatarsal carries a unique ridge that fits into a groove along the top outer side of the second metatarsal, causing a tighter connection. Modern restoration of Megalosaurus, with mostly hypothetical head. For decades after its discovery, Megalosaurus was seen by researchers as the definitive or typical large carnivorous dinosaur. As a result, it began to function as a "wastebasket taxon", and many large or small carnivorous dinosaurs from Europe and elsewhere were assigned to the genus. This slowly changed during the 20th century, when it became common to restrict the genus to fossils found in the middle Jurassic of England. Further restriction occurred in the late 20th and early 21st centuries, researchers such as Ronan Allain and Dan Chure suggesting that the Stonesfield Slate fossils perhaps belonged to several, possibly not directly related, species of theropod dinosaur. Subsequent research seemed to confirm this hypothesis, and the genus Megalosaurus and species M. bucklandii became generally regarded as limited to the taxon having produced the lectotype, the dentary of the lower jaw. Furthermore, several researchers failed to find any characteristics in that jaw that could be used to distinguish Megalosaurus from its relatives, which would mean the genus were a nomen dubium. However, a comprehensive study by Roger Benson and colleagues in 2008, and several related analyses published in subsequent years, overturned the previous consensus by identifying several autapomorphies, or unique distinguishing characteristics, in the lower jaw that could be used to separate Megalosaurus from other megalosaurids. Various distinguishing traits of the lower jaw have been established. The longitudinal groove on the outer surface of the dentary is wide. The third tooth socket of the dentary is not enlarged. Seen from above, the dentary is straight without an expanded jaw tip. The interdental plates, reinforcing the teeth from behind, of the lower jaw are tall. Benson also concluded it would be most parsimonious to assume that the Stonesfield Slate material represents a single species. If so, several additional distinctive traits can be observed in other parts of the skeleton. The low vertical ridge on the outer side of the ilium, above the hip joint, shows parallel vertical grooves. The bony skirts between the shafts of the ischia are thick and touch each other forming an almost flat surface. There is a boss present on the lower outer side of the ischium shaft with a rough surface. The underside of the second sacral vertebra has an angular longitudinal keel. A ridge on the upper side of the third metatarsal connected to a groove in the side of the second metatarsal. The middle of the front edge of the scapula forms a thin crest. In 1824, Buckland assigned Megalosaurus to the Sauria, assuming within the Sauria a close affinity with modern lizards, more than with crocodiles. In 1842, Owen made Megalosaurus one of the first three genera placed in the Dinosauria. In 1850, Prince Charles Lucien Bonaparte coined a separate family Megalosauridae with Megalosaurus as the type genus. For a long time, the precise relationships of Megalosaurus remained vague. It was seen as a "primitive" member of the Carnosauria, the group in which most large theropods were united. Living in what is now Europe, during the Jurassic Period (~201 to ~145 million years ago), Megalosaurus may have hunted stegosaurs and sauropods. Repeated descriptions during the nineteenth and early twentieth century of Megalosaurus hunting Iguanodon (another of the earliest dinosaurs named) through the forests that then covered the continent are now known to be inaccurate, because Iguanodon skeletons are found in much younger Early Cretaceous formations. The only specimens belonging to Megalosaurus bucklandii are from the Lower/Middle Bathonian of Oxfordshire and Gloucestershire. No material from outside of the Bathonian formations of England can be referred to Megalosaurus. It lived alongside the theropods Cruxicheiros, Iliosuchus and Streptospondylus, and the sauropods Cardiodon, Cetiosaurus, and possibly Cetiosauriscus. The pterosaur Rhamphocephalus, and indeterminate sauropod and ornithopod remains have also been found alongside fossils of Megalosaurus. Benson in 2010 concluded from its size and common distribution that Megalosaurus was the apex predator of its habitat. He saw the absence of Cetiosaurus on the French Armorican Massif as an indication that Megalosaurus too did not live on that island and was limited to the London-Brabant Massif. 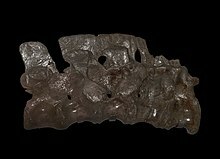 A Megalosaurus rib figured in 1856 and 1884 by Sir Richard Owen has a pathological swollen spot near the base of its capitular process. The swollen spot appears to have been caused by a healed fracture and is located at the point where it would have articulated with its vertebra. During the later nineteenth century, Megalosaurus was seen as the typical carnivorous dinosaur. If remains were found that were not deemed sufficiently distinct to warrant a separate genus, often single teeth, these were classified under Megalosaurus, which thus began to function as a wastebasket taxon, a sort of default genus. Eventually, Megalosaurus contained more species than any other non-avian dinosaur genus, most of them of dubious validity. During the twentieth century, this practice was gradually discontinued; but scientists discovering theropods that had been mistakenly classified under a different animal group in older literature, still felt themselves forced to rename them, again choosing Megalosaurus as the default generic name. The first published lapsus calami of Megalosaurus was named in 1913. Ameghino added a letter, a "u", into Megalosaurus. In doing so, he named a new genus, Megalousaurus, only to create a synonym of Megalosaurus. In 1926, von Huene published and article on a new species. In the paper, he misspelt the genus Megalosaurus four times. These misspellings were Megalasaurus, Megolosaurus, Megalosaurns and Megalosausus. Each time, he created a new synonym of Megalosaurus. Later, in 1964, Walker created another lapsus calami of Megalosaurus. This time, the "g" in its name was accidentally replaced with a "q", erecting Meqalosaurus. In 1857, Joseph Leidy renamed Deinodon horridus (Leidy, 1856) into Megalosaurus horridus, the "frightening one", a genus based on teeth. In 1858, Friedrich August Quenstedt named Megalosaurus cloacinus, based on a probable Late Triassic theropod tooth found near Bebenhausen, specimen SMNH 52457. It is a nomen dubium. In 1869 Eugène Eudes-Deslongchamps named Megalosaurus insignis, the "significant", based on a theropod tooth found near La Hève in Normandy that was twelve centimetres long, a third longer than the teeth of M. bucklandii. The name at first remained a nomen nudum, but a description was provided, in 1870, by Gustave Lennier. Today, it is considered a nomen dubium, an indeterminate member of the Theropoda, the specimen having in 1944 been destroyed by a bombardment. In 1870, Jean-Baptiste Greppin named Megalosaurus meriani based on specimen MH 350, a premaxillary tooth found near Moutier and part of the collection of Peter Merian. Today, this is either referred to Ceratosaurus or seen as a nomen dubium, an indeterminate member of the Ceratosauria. In 1871, Emanuel Bunzel named remains found near Schnaitheim Megalosaurus schnaitheimi. It is a nomen nudum, the fossils possibly belonging to Dakosaurus maximus. In 1876, J. Henry, a science teacher at Besançon, in a published dissertation named four Late Triassic possible dinosaur teeth found near Moissey Megalosaurus obtusus, "the blunt one". It is a nomen dubium, perhaps a theropod or some indeterminate predatory archosaur. In 1881, Harry Govier Seeley named two possible theropod teeth found in Austria Megalosaurus pannoniensis. The specific name refers to Pannonia. It is a nomen dubium, possibly an indeterminate member of the Dromaeosauridae or Tyrannosauroidea. In 1883, Seeley named Megalosaurus bredai, based on a thighbone, specimen BMNH 42997 found near Maastricht, the Netherlands. The specific name honours Jacob Gijsbertus Samuël van Breda. In 1932, this was made a separate genus Betasuchus by Friedrich von Huene. 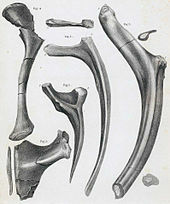 In 1882, Henri-Émile Sauvage named remains found at Louppy-le-Château, teeth and vertebrae from the Early Cretaceous, Megalosaurus superbus, "the proud one". In 1923, this became the genus Erectopus. In 1884/1885, Wilhelm Barnim Dames, based on specimen UM 84, a tooth from the Early Cretaceous, named Megalosaurus dunkeri, the specific name honouring Wilhelm Dunker. In 1923, this was made a separate genus Altispinax. In 1885, Joseph Henri Ferdinand Douvillé renamed Dakosaurus gracilis Quenstedt 1885 into Megalosaurus gracilis. Today the renaming is generally rejected. In 1889, Richard Lydekker named Megalosaurus oweni, the specific name honouring Owen, based on a series of metatarsals from the Early Cretaceous, specimen BMNH R2556. In 1991, this was made a separate genus Valdoraptor. In 1892, Edward Drinker Cope renamed Ceratosaurus nasicornis Marsh 1884 into Megalosaurus nasicornis. This had been largely motivated by a desire to annoy his rival Othniel Charles Marsh and the name has found no acceptance. In 1896, Charles Jean Julien Depéret named Megalosaurus crenatissimus, "the much crenelated", based on remains from the Late Cretaceous found in Madagascar. In 1955 this was made a separate genus Majungasaurus. The generic name Laelaps, used by Cope to denote a theropod, had been preoccupied by a mite. Marsh had therefore provided the replacement name Dryptosaurus, but Henry Fairfield Osborn, a partisan of Cope, rejected this replacement and thus in 1898 renamed Laelaps aquilunguis Cope 1866 into Megalosaurus aquilunguis. In 1901 Baron Franz Nopcsa renamed Laelaps trihedrodon Cope 1877 into Megalosaurus trihedrodon. In the same publication Nopcsa renamed Poekilopleuron valens Leidy 1870 into Megalosaurus valens; this probably represents fossil material of Allosaurus. In 1902, Nopcsa named Megalosaurus hungaricus based on two teeth found in Transylvania, then part of the Kingdom of Hungary. The specimens, MAFI ob. 3106, were later lost. It represents an indeterminate theropod. In 1903, Louis Dollo named Megalosaurus lonzeensis based on a manual claw found near Lonzee in Belgium. He had first reported this claw in 1883, and as a result some sources by mistake indicate this year as the date of the naming. It perhaps represents a member of the Noasauridae, or an indeterminate member of the Coelurosauria. In 1907/1908, von Huene renamed Streptospondylus cuvieri Owen 1842, based on a presently lost partial vertebra, into Megalosaurus cuvieri. This is today seen as a nomen dubium, an indeterminate member of the Tetanurae. In 1909, Richard Lydekker named Megalosaurus woodwardi, based on a maxilla with tooth, specimen BMNH 41352. This is today seen as a nomen dubium, an indeterminate member of the Theropoda. In 1910, Arthur Smith Woodward named Megalosaurus bradleyi based on a skull from the Middle Jurassic, the specific name honouring the collector F. Lewis Bradley. In 1926, this was made a separate genus Proceratosaurus. In 1920, Werner Janensch named Megalosaurus ingens, "the enormous", based on specimen MB R 1050, a twelve centimetre long tooth from German East Africa. It possibly represents a large member of the Carcharodontosauridae; Carrano e.a. saw it as an indeterminate member of the Tetanurae. In 1923, von Huene renamed Poekilopleuron bucklandii Eudes-Deslongchamps 1838 into Megalosaurus poikilopleuron. Today, the genus Poekilopleuron is generally seen as valid. In the same publication, von Huene named two additional Megalosaurus species. The first was Megalosaurus parkeri, its specific name honouring William Kitchen Parker and based on a pelvis, leg bones and vertebrae from the Late Cretaceous. This was made the separate genus Metriacanthosaurus in 1964. The second was Megalosaurus nethercombensis, named after its provenance from Nethercombe and based on two dentaries, leg bones, a pelvis and vertebrae from the Middle Jurassic, which von Huene himself in 1932 made the separate genus Magnosaurus. In 1925, Depéret, based on two teeth from Algeria, named Megalosaurus saharicus. In 1931/1932 this was made the separate genus Carcharodontosaurus. In 1956 von Huene by mistake named the same species as Megalosaurus africanus, intending to base it on remains from Morocco but referring the Algerian teeth; this implies that M. africanus is a junior objective synonym of M. saharicus. In 1926, von Huene named Megalosaurus lydekkeri, its specific name honouring Richard Lydekker, based on BMNH 41352, i.e. the same specimen that had already been made the holotype of M. woodwardi (Lydekker, 1909). This implies that M. lydekkeri is a junior objective synonym of M. woodwardi. It is likewise seen as a nomen dubium. 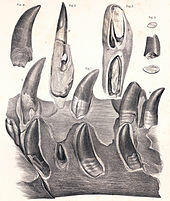 In the same publication von Huene named Megalosaurus terquemi based on three teeth found near Hettingen, its specific name honouring Olry Terquem. It is seen as a nomen dubium, the fossil material probably representing some member of the Phytosauria or some other archosaur. In 1932, a work by von Huene mentioned a Megalosaurus (Magnosaurus) woodwardi, a synonym of Magnosaurus woodwardi named in the same book. Its type specimen is differing from the earlier Megalosaurus woodwardi (Lydekker, 1909), the two names are not synonyms. In 1954 Samuel Welles named Megalosaurus wetherilli. This species is exceptional in being based on a rather complete skeleton, found in Arizona, from the Early Jurassic. Its specific name honours John Wetherill. In 1970, Welles made this the separate genus Dilophosaurus. In 1955, Albert-Félix de Lapparent named Megalosaurus mersensis based on a series of twenty-three vertebrae found near Tizi n'Juillerh in a layer of the El Mers Formation of Morocco. This probably represents a member of the Mesosuchia. In 1956, Alfred Sherwood Romer renamed Aggiosaurus nicaeensis Ambayrac 1913, based on a lower jaw found near Nice, on the authority of von Huene into Megalosaurus nicaeensis. Originally it had been considered to be some crocodilian; present opinion confirms this. In 1957, de Lapparent named Megalosaurus pombali based on three teeth found near Pombal in the Jurassic of Portugal. Today it is seen as a nomen dubium, an indeterminate member of the Theropoda. In 1965, Oskar Kuhn renamed Zanclodon silesiacus Jaekel 1910 into Megalosaurus? silesiacus. It is a nomen dubium based on the tooth of some indeterminate predatory Triassic archosaur, found in Silesia, perhaps a theropod. In 1966, Guillermo del Corro named Megalosaurus inexpectatus, named "the unexpected" as it was discovered on a sauropod site with remains of Chubutisaurus, based on specimen MACN 18.172, a tooth found in Argentina. It might represent a member of the Carcharodontosauridae. In 1970, Rodney Steel named two Megalosaurus species. Firstly, he renamed Iliosuchus incognitus Huene 1932 into Megalosaurus incognitus. Secondly, he renamed Nuthetes destructor Owen 1854 into Megalosaurus destructor. Both genera are today seen as not identical to Megalosaurus. Michael Waldman in 1974 renamed Sarcosaurus andrewsi Huene 1932 into Megalosaurus andrewsi. Indeed, Sarcosaurus andrewsi is today by some scientists not seen as directly related to the type species of Sarcosaurus: Sarcosaurus woodi. In the same publication Waldman named Megalosaurus hesperis, "the western one", based on skull fragments from the Middle Jurassic. In 2008 this was made the separate genus Duriavenator. Del Corro in 1974 named Megalosaurus chubutensis, based on specimen MACN 18.189, a tooth found in Chubut Province. It is a nomen dubium, a possible carcharodontosaurid, or a very large abelisaurid. In 1985, Zhao Xijin named two Megalosaurus species found in Tibet. He had earlier mentioned these species in an unpublished dissertation of 1983, implying they initially were invalid nomina ex dissertatione. However, his 1985 publication did not contain descriptions so the names are still nomina nuda. The first species was Megalosaurus dapukaensis, named for the Dapuka Group. It was, in the second edition of The Dinosauria, by mistake spelled as Megalosaurus cachuensis. The second species was Megalosaurus tibetensis. In 1987/1988, Monique Vianey-Liaud renamed Massospondylus rawesi (Lydekker, 1890), based on specimen NHMUK R4190, a tooth from the Maastrichtian of India, into Megalosaurus rawesi. This is a nomen dubium, a possible member of the Abelisauridae. In 1988, Gregory S. Paul renamed Torvosaurus tanneri Galton & Jensen 1979 into Megalosaurus tanneri. The change has found no acceptance. In 1973, Anatoly Konstantinovich Rozhdestvensky had renamed Poekilopleuron schmidti Kiprijanow 1883 into a Megalosaurus sp. However, as it is formally impossible to change a named species into an unnamed one, George Olshevsky in 1991 used the new combination Megalosaurus schmidti. It is a chimaera. In 1993, Ernst Probst and Raymund Windolf by mistake renamed Plateosaurus ornatus Huene 1905 into Megalosaurus ornatus by mentioning the latter name in a species list. This can be seen as a nomen vanum. The same publication listed the ichnospecies Megalosauropus teutonicus Kaever & Lapparent 1974 as a Megalosaurus teutonicus. In 1997, Windolf renamed Saurocephalus monasterii Münster 1846, based on a tooth found near Hannover, into Megalosaurus monasterii. It is a nomen dubium, an indeterminate member of the Theropoda. In 1998, Peter Malcolm Galton renamed Zanclodon cambrensis Newton 1899, based on a left lower jaw, specimen BGS 6532 found at Bridgend, into ?Megalosaurus cambrensis because it was not a basal sauropodomorph. It is a senior synonym of Gressylosaurus cambrensis Olshevsky 1991. The specific name refers to Cambria, the Latin name of Wales. It probably represents a member of the Coelophysoidea, or some other predatory archosaur. The complex naming history can be summarised in a formal species list. The naming authors are directly mentioned behind the name. If the name has been changed, they are placed in parentheses and the authors of the changed name are mentioned behind them. The list also indicates whether a name has been insufficiently described (nomen nudum), is not taxonomically identifiable at the generic level (nomen dubium), or fallen out of use (nomen oblitum). Reclassifications under a different genus are mentioned behind the "=" sign; if the reclassification is today considered valid, it is listed under Reassigned species. ^ a b c d e f Olshevsky, G. (1991). "A revision of the parainfraclass Archosauria Cope, 1869, excluding the advanced Crocodylia" (PDF). Mesozoic Meanderings 2: 196. ^ Plot, R. (1677). "The Natural History of Oxford-shire, Being an Essay Toward the Natural History of England". Mr. S. Miller's: 142. doi:10.5962/bhl.title.23488. ^ Weishampel, David B.; White, Nadine (2003). "Humble beginnings". The Dinosaur Papers: 1676–1906. Washington, D. C.: Smithsonian Institution Press. p. 2. ISBN 978-1-58834-122-8. ^ "Robert Plot: A brief biography of this important geologists life and work" (PDF). Oxford University Museum of Natural History. p. 4. Retrieved 14 June 2013. ^ a b Sarjeant, William A. S. (1997). "The earliest discoveries". In Farlow, James O.; Brett-Surman, Michael K. (eds.). The Complete Dinosaur. Bloomington: Indiana University Press. pp. 3–11. ISBN 978-0-253-33349-0. ^ Brookes, R. (1763). "A New and Accurate System of Natural History: The Natural History of Waters, Earths, Stones, Fossils, and Minerals with their Virtues, Properties and Medicinal Uses, to which is added, the Method in which Linnaeus has treated these subjects". J. Newberry. 5: 364. OCLC 690730757. ^ Halstead, L. B. (1970). 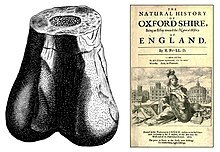 "Scrotum humanum Brookes 1763 - the first named dinosaur". Journal of Insignificant Research. 5: 14–15. ^ Halstead, L. B.; Sarjeant, W. A. S. (1993). "Scrotum humanum Brookes - the earliest name for a dinosaur". Modern Geology. 18: 221–224. ^ Gunther, R. T. (1925). "Early Science in Oxford". Isis. 8 (2): 375–377. JSTOR 223661. ^ a b c Benson, R. B. J. (2009). "An assessment of variability in theropod dinosaur remains from the Bathonian (Middle Jurassic) of Stonesfield and New Park Quarry, UK and taxonomic implications for Megalosaurus bucklandii and Iliosuchus incognitus". Palaeontology. 52 (4): 857–877. doi:10.1111/j.1475-4983.2009.00884.x. ^ Parkinson, J. (1822). "Outlines of Oryctology. An introduction to the study of fossil organic remains, especially those found in the British Strata". M.A. Nattali: 305. doi:10.5962/bhl.title.22356. ^ a b Glut, D. F. (2013). Dinosaurs: The Encyclopedia 1. McFarland & Company, Incorporated Publishers. ISBN 978-0-7864-7222-2. ^ a b c d Buckland, W. (1824). "Notice on the Megalosaurus or great Fossil Lizard of Stonesfield". Transactions of the Geological Society of London. 2. 1 (2): 390–396. doi:10.1144/transgslb.1.2.390. ^ Allain, R. (2001). "Redescription de Streptospondylus altdorfensis, le dinosaure théropode de Cuvier, du Jurassique de Normandie" (PDF). Geodiversitas. 23 (3): 349–367. ^ Molnar, R.E. ; Seriozha M.K. & Dong Z. (1990). "Carnosauria" In: Weishampel, D. B.; Dodson, P.; Osmolska, H., eds. (2007). The Dinosauria. Berkeley: University of California Press. pp. 169–209. ISBN 978-0-520-25408-4. ^ von Ritgen, F. A. (1826). "Versuchte Herstellung einiger Becken urweltlichter Thiere". Nova Acta Academiae Caesareae Leopoldino-Carolinae Germanicae Naturae Curiosorum. 13: 331–358. ^ Mantell, G. (1827). Illustrations of the geology of Sussex: a general view of the geological relations of the southeastern part of England, with figures and descriptions of the fossils of Tilgate Forest. London: Fellow of the Royal College of Surgeons. p. 92. ^ Meyer, C. E. H. (1832). Palaeologica zur Geschichte der Erde. Frankfurt am Main: Verlag von Siegmund Schmerber. p. 110. ^ Buckland, W. (1836). "Geology and Mineralogy considered with reference to Natural Theology". W. Pickering: 180–183. doi:10.5962/bhl.title.36097. ^ a b Owen, R. (1842). "Report on British fossil reptiles, part II". Report of the British Association for the Advancement of Science. 11: 32–37. ^ a b c d Naish, D.; Martill, D. M. (2007). "Dinosaurs of Great Britain and the role of the Geological Society of London in their discovery: basal Dinosauria and Saurischia". Journal of the Geological Society of London. 164 (3): 493–510. Bibcode:2007JGSoc.164..493N. doi:10.1144/0016-76492006-032. ^ Oshevsky, G. (1997). "Becklespinax". Cleveland Museum of Natural History. Retrieved 15 September 2013. ^ Glendening, J. (2013). Science and Religion in Neo-Victorian Novels: Eye of the Ichthyosaur. Routledge. pp. 39–40. ISBN 978-0-415-81943-5. ^ "Dinosaur Mounts on display" (PDF). Oxford University Museum of Natural History. Retrieved 14 September 2013. ^ a b c d e f g h i j k l m n o p Benson, R. B. J. (2010). "A description of Megalosaurus bucklandii (Dinosauria: Theropoda) from the Bathonian of the UK and the relationships of Middle Jurassic theropods". Zoological Journal of the Linnean Society. 158 (4): 882–935. doi:10.1111/j.1096-3642.2009.00569.x. ^ Day, J. J.; Barrett, P. M. (2004). "Material Referred to Megalosaurus (Dinosauria: Theropoda) from the Middle Jurassic of Stonesfield, Oxfordshire, England: one taxon or two". Proceedings of the Geologists' Association. 115 (4): 359–366. doi:10.1016/S0016-7878(04)80015-4. ^ a b c Benson, R.B.J. ; Barrett, P.M.; Powell, H.P. & Norman, D.B. (2008). "The taxonomic status of Megalosaurus bucklandii (Dinosauria, Theropoda) from the Middle Jurassic of Oxfordshire, UK". Palaeontology. 51 (2): 419–424. doi:10.1111/j.1475-4983.2008.00751.x. ^ Huxley, T. (1869). "On the upper jaw of Megalosaurus". Quarterly Journal of the Geological Society. 25 (1–2): 311–314. doi:10.1144/GSL.JGS.1869.025.01-02.58. ^ Bakker, R. T.; Siegwarth, J.; Kralis, D.; Filla, J. (1992). "Edmarka rex, a new, gigantic theropod dinosaur from the Middle Morrison Formation, Late Jurassic of the Como Bluff outcrop, with comments on the evolution of the chest region and shoulder in theropods and birds and a discussion of the five cycles of origin and extinction among giant dinosaurian predators". Hunteria. 2 (9): 1–24. ^ Reynolds, S. H. (1938). "On a collection of reptilian bones from the Oölite near Stow-in-the-Wold, Glos". Reports of the British Association for the Advancement of Science. 1937: 356–357. ^ Reynolds, S. H. (1939). "On a collection of reptile bones from the Oölite near Stow-on-the-Wold, Gloucestershire". Geological Magazine. 76 (5): 193–214. Bibcode:1939GeoM...76..193R. doi:10.1017/S0016756800070990. ^ Day, J. J.; Norman, D. B.; Gale, A. S.; Upchurch, P.; Powell, H. P. (2004). "A Middle Jurassic dinosaur trackway site from Oxfordshire, UK". Palaeontology. 47 (2): 319–348. doi:10.1111/j.0031-0239.2004.00366.x. ^ a b c d Benton, Michael J. (2012). Prehistoric Life. Edinburgh, Scotland: Dorling Kindersley. p. 259. ISBN 978-0-7566-9910-9. ^ Norman, D. B. (1984). The Illustrated Encyclopedia of Dinosaurs. London: Salamander Books. p. 400. ISBN 978-0-7548-1573-0. ^ Paul, Gregory S. (1988). Predatory Dinosaurs of the World. Simon & Schuster. p. 281. ISBN 978-0-671-61946-6. ^ a b Paul, G. S. (2010). The Princeton Field Guide to Dinosaurs. Princeton University Press. pp. 86, 177. ISBN 978-0-691-13720-9. ^ a b c d e f g Weishampel, David B.; Dodson, Peter; Osmolska, Halszka (2004). The Dinosauria, 2nd. Berkeley: University of California Press. p. 861. ISBN 978-0-520-24209-8. ^ Bonaparte, C. L. (1850). Conspectus Systematum. Herpetologiae et Amphibiologiae. Editio Altera Reformata [Survey of the systems of reptiles and amphibians. Second revised edition] (in Latin). Lugudini Batavorum: E. J. Brill. p. 1. OCLC 67896436. ^ a b Benson, R. "A new large-bodied theropod dinosaur from the Middle Jurassic of Warwickshire, United Kingdom" (PDF). Acta Palaeontologica Polonica. Retrieved 8 September 2013. ^ Molnar, R. E. (2001). "Theropod paleopathology: a literature survey": In: Tanke, D. H.; Carpenter, K. (2001). Mesozoic Vertebrate Life. Indiana University Press. pp. 337–363. ISBN 978-0-253-33907-2. ^ Leidy, J. (1857). "List of extinct Vertebrata, the remains of which have been discovered in the region of the Missouri river, with remarks on their geological age". Proceedings of the Academy of Natural Sciences of Philadelphia. 9: 89–91. ^ Quenstedt, F. A. (1858). Der Jura. Tübingen: Verlag der Laupp'schen Buchhandlung, Laupp & Birbot. p. 842. OCLC 74915734. ^ Société linnéenne de Normandie (1869). Bulletin de la Société linnéenne de Normandie. 2 (in French). 3. p. 528. ISBN 978-1-174-78906-9. ^ Lennier, G. (1870). Études géologiques et paléontologiques sur l'Embouchure de la Seine et les Falaises de la Haute-Normandie: ouvrage couronné par la Société Impériale Havraise d'Études Diverses et la Société Libre d'Émulation de Rouen. Atlas. 2. Société Impériale Havraise d'Études Diverses & la Société Libre d'Émulation de Rouen. p. 264. ISBN 978-1-246-42273-3. ^ Greppin, J. P. (1870). Description géologique du Jura bernois et de quelques districts adjacents compris dans la feuille 7 de l'atlas fédéral. Matériaux pour la carte géologique de la Suisse. 8. En commission chez J. Dalp. pp. 1–357. ISBN 978-1-247-59199-5. ^ Henry, J. (1876). "L'Infralias dans la Franche-Comté". Mémoires de la Société d'Émulation du Doubs. 4. 10: 287–486. ^ Seeley, H. G. (1881). "On the reptile fauna of the Gosau Formation preserved in the Geological Museum of the University of Vienna". Quarterly Journal of the Geological Society of London. 37 (1–4): 620–707. doi:10.1144/GSL.JGS.1881.037.01-04.49. ^ Seeley, H. G. (1883). "On the dinosaurs from the Maastricht beds". Quarterly Journal of the Geological Society of London. 39 (1–4): 246–253. doi:10.1144/GSL.JGS.1883.039.01-04.19. ^ a b c Huene, F. von (1932). "Die fossile Reptil-Ordnung Saurischia, ihre Entwicklung und Geschichte". Monographien zur Geologie und Palaeontologie. 1. 4 (1–2): 361. ^ Sauvage, H. E. (1882). "Recherches sur les reptiles trouvés dans le Gault de l'est du bassin de Paris". Mémoires de la Société Géologique de France. 3. 2 (4): 1–42. OCLC 25237760. ^ a b c Huene, F. von (1923). "Carnivorous Saurischia in Europe since the Triassic". Bulletin of the Geological Society of America. 34 (3): 449–458. Bibcode:1923GSAB...34..449V. doi:10.1130/gsab-34-449. ^ Dames, W.B. (1885). "Vorlegung eines Zahnes von Megalosaurus aus den Wealden des Deisters". Sitzungsberichte der Gesellschaft Naturforschender Freunde zu Berlin. 36: 186–188. ^ Douvillé, J. H. F. (1885). "Remarques sur Halitherium et sur un mégalosaurien". Bulletin de la Société Géologique de France. 3. 13: 441. ^ Lydekker, R. (1889). "Note on some points in the nomenclature of fossil reptiles and amphibians, with preliminary notices of two new species". Geological Magazine. 3. 6 (7): 325–326. Bibcode:1889GeoM....6..325L. doi:10.1017/S0016756800176472. ^ Cope, E. D. (1892). "Skull of the dinosaurian Laelaps incrassatus Cope". Proceedings of the American Philosophical Society. 30: 240–246. ^ Depéret, C. J. J. (1896). "Note sur les dinosauriens sauropodes & théropodes du Crétacé supérieur de Madagascar". Bulletin de la Société Géologique de France. 3. 24: 176–194. ^ Lavocat, R. (1955). "Sur une portion de mandibule de théropode provenant du Crétacé supérieur de Madagascar". Bulletin du Muséum National d'Histoire Naturelle, Paris. 2. 27 (3): 256–259. ^ Osborn, H. F. (1898). "Paleontological problems". Science. 2. 7 (162): 145–147. Bibcode:1898Sci.....7..145.. doi:10.1126/science.7.162.145. PMID 17777631. ^ Nopcsa, F. (1901). "Synopsis und Abstammung der Dinosaurier". Földtany Közlöny. 30 (1901): 247–279. ^ Nopcsa, F. (1902). "Notizen über cretacische Dinosaurier. Teil 2. Megalosaurus hungaricus nov. sp. ein Theropode der Siebenburgischen Kreide". Sitzungsberichte der Mathematisch-Naturwissenschaftlichen Classe der Kaiserlichen Akademie der Wissenschaften. 3 (1): 104–107. ^ Dollo, L. (1903). "Les dinosauriens de la Belgique". Comptes Rendus de l'Académie des Sciences de Paris. 136: 565–567. ^ Dollo, L. (1883). "Note sur les restes de dinosauriens rencontrés dans le Crétacé supérieur de la Belgique". Bulletin du Musée Royal d'Histoire Naturelle de Belgique. 2: 205–221. ^ Lydekker, R. (1909). "Vertebrate Palaeontology in 1908". Science Progress in the Twentieth Century: A Quarterly Journal of Scientific Work & Thought. 3 (11): 450–471. ^ Woodward, A. S. (1910). "On a skull of Megalosaurus from the Great Oolite of Minchinhampton (Gloucestershire)". Quarterly Journal of the Geological Society of London. 66 (262): 111–115. doi:10.1144/GSL.JGS.1910.066.01-04.07. ^ Huene, F. von (1926). "On several known and unknown reptiles of the order Saurischia from England and France". Annals and Magazine of Natural History. 9. 17 (101): 473–489. doi:10.1080/00222932608633437. ^ Janensch, W. (1920). "Ueber Elaphrosaurus bambergi und die Megalosaurier aus den Tendaguru Schichten Deutsch-Ostafrikas". Sitzungsberichte der Gesellschaft Naturforschender Freunde zu Berlin: 225–235. ^ Allain, R.; Chure, D. J. (2002). "Poekilopleuron bucklandii, the theropod dinosaur from the Middle Jurassic (Bathonian) of Normandy". Palaeontology. 45 (6): 1107–1121. doi:10.1111/1475-4983.00277. ^ Walker, W. D. (1964). "Triassic reptiles from the Elgin area: Ornithosuchus and the origin of carnosaurs". Philosophical Transactions of the Royal Society of London. Series B, Biological Sciences. 248 (744): 53–134. Bibcode:1964RSPTB.248...53W. doi:10.1098/rstb.1964.0009. ^ Depéret, C.; Savornin, J. (1925). "Sur la découverte d'une faune de Vertébrés albiens à Timimoun (Sahara occidental)". Comptes Rendus de l'Académie des Sciences de Paris. 181: 1108–1111. ^ Stromer, E. (1931). "Ergebnisse der Forschungsreisen Prof. E. Stromers in den Wüsten Ägyptens. II. Wirbeltier-Reste der Baharîjestufe (unterstes Cenoman). 10. Ein Skelett-Rest von Carcharodontosaurus nov. gen". Abhandlungen der Bayerischen Akademie der Wissenschaften Mathematisch-naturwissenschaftliche Abteilung, Neue Folge. 9: 1–23. ^ Huene, F. von (1956). Palaeontologie und Phylogenie der Niederen Tetrapoden. 1. Jena: Veb Gustav Fischer. p. 716. OCLC 489883421. ^ Huene, F. von (1926). "The carnivorous Saurischia in the Jura and Cretaceous formations, principally in Europe". Revista Museo de la Plata. 29: 35–167. ^ Welles, S. (1954). "New Jurassic dinosaur from the Kayenta Formation of Arizona". Bulletin of the Geological Society of America. 65 (6): 591–598. Bibcode:1954GSAB...65..591W. doi:10.1130/0016-7606(1954)65[591:NJDFTK]2.0.CO;2. ^ Welles, S. P. (1970). "Dilophosaurus (Reptilia: Saurischia), a new name for a dinosaur". Journal of Paleontology. 44: 989. ^ Lapparent, A. F. (1955). "Études paléontologiques des Vertébrés du Jurassique d'El Mers (Moyen-Atlas)". Notes et Mémoires du Service Géologique du Maroc. 124: 1–36. ^ Romer, A. S. (1956). Osteology of the Reptiles. University of Chicago Press. p. 300. ISBN 978-0-89464-985-1. ^ de Lapparent, A. F.; Zbyszewski, G. (1957). "Les dinosauriens du Portugal". Mémoires des Services Géologiques du Portugal, Nouvelle. 2: 63. ^ Kuhn, O. (1965). "Saurischia (Supplementum 1)". 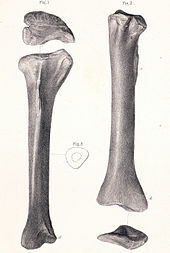 In: Zeiss, A. Fossilium Catalogus 1. Animalia 109 (1st ed.). Springer. p. 94. ISBN 978-90-6193-368-7. ^ Corro, G. del (1966). "Un nuevo dinosaurio Carnivoro del Chubut (Argentina)". Comunicaciones del Museo Argentino de Ciencias Naturales "Bernardino Rivadavia" e Instituto Nacional de Investigación de las Ciencias Naturales: Paleontologia. 1 (1): 1–4. ^ Steel, R. (1970). Handbuch der Paläoherpetologie. Part 14: Saurischia. Geben Sie die erste Bewertung für diesen Artikel ab. pp. 27–38. ^ Waldman, M. (1974). "Megalosaurids from the Bajocian (Middle Jurassic) of Dorset". Palaeontology. 17 (2): 325–339. ^ Benson, R.B.J. (2008). "A redescription of 'Megalosaurus' hesperis (Dinosauria, Theropoda) from the Inferior Oolite (Bajocian, Middle Jurassic) of Dorset, United Kingdom". Zootaxa. 1931: 57–67. ^ Corro, G. del (1974). "Un nuevo megalosaurio (Carnosaurio) del Cretácico de Chubut (Argentina)". Comunicación del Museo Argentino de Ciencias Naturales "Bernardino Rivadavia" e Instituto Nacional de Investigación de las Ciencias Naturales: Paleontología. 1: 37–44. ^ Poblete, F. & Calvo, J.O. (2004). "Megalosaurus chubutensis del Corro: un posible Carcharodontosauridae del Chubut". Ameghiniana. 41 (=4): 59R–60R. ^ Vianey-Liaud, M.; Jain, S.L. ; Sahni, A. (1988). "Dinosaur eggshells (Saurischia) from the Late Cretaceous Intertrappean and Lameta formations (Deccan, India)". Journal of Vertebrate Paleontology. 7 (4): 408–424. doi:10.1080/02724634.1988.10011673. ^ Paul, G.S. (1988). Predatory Dinosaurs of the World. New York: Simon & Schuster. p. 282. ^ Probst, E. & Raymund, F. (1993). Dinosaurier in Deutschland. München: C. Bertelsmann Verlag. p. 26. ISBN 978-3-570-02314-3. ^ Galton, P.M. (1998b). "Saurischian dinosaurs from the Upper Triassic of England: Camelotia (Prosauropoda, Melanorosauridae) and Avalonianus (Theropoda, ?Carnosauria)". Palaeontographica Abteilung A. 250 (4–6): 155–172. ^ Naish, D. (2001). "Newtonsaurus". Cleveland Museum of Natural History. Retrieved 15 September 2013. ^ Pickering, S. (1995). Jurassic Park: Unauthorized Jewish Fractals in Philopatry (2nd ed.). Capitola: A Fractal Scaling in Dinosaurology Project. p. 478.